Barbara Alex - Works in oil paints, watercolor, charcoal and pastel. Subjects are portraits & landscapes. Sue Banks - Trompe l’oeil. JoAnne Bauer - Assemblages, handmade papers, collographs and collage. Lori Racicot Burrous - Use of color and multiple layers of paint to create texture in my painting. Avis Cherichetti - Pottery techniques include Raku, Saggar & Stoneware, pots to light fixtures & more. Irene Dizes - Wearable art using nuno felting. Ina Forman - Quilts with flowing designs, creating a variety of textures with added embellishments. Chris Gooding - Grows her own gourds and embellishes them, using feathers, seed pods, yarn & more. Luciana Heineman - watercolor and oil painter who paints landscapes and other natural settings. 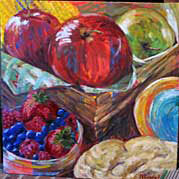 Irene Hilbert - painter and mixed media artist working in a variety of textures and styles. Kassie Huhtanen - Sculpted stoneware, works in wood, metal, salvaged goods and digital photograph. 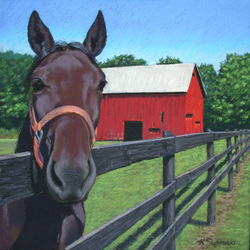 Karen Israel - Award winning pastel artist whose work is diverse in subject matter. Charlene Li - Thrown, hand built and slab pottery, experimenting with glazes. Linda Lilling - Oil painting artist with landscape and still life works. Janet Miller – small scale lifes in oils, capturing beauty and whimsy in everyday objects. Donna Shaw – Pen and ink drawings inspired by architectural beauty and nature. Martha Simpson – Sculptural forms through needle felting, working with silk and merino wool. Karen Suponski – painting pastels including still life, interiors, landscapes, and other subjects. Alice Turcotte – Composes still life and landscapes working in collage, sometimes acrylic paints. WOMACK - Contradiction and geometrical design are two of the many faces of Womack's paintings. The Women Artists Collective is a group of visual artists in Connecticut who come together to energize & support each other in the creative process. They are painters, printmakers, potters, quilters, fiber artists, and jewelers. They work in glass, ink, paint, clay, fabrics, canvas, found objects and paper. Their work is abstract, representational, metaphoric, narrative & includes figurative subjects, among many others.